Distribution: The Umbrella Shell is a large opisthobranch species that has a very broad distribution throughout the Pacific and Indian Oceans. It has been recorded from Africa, Hawaii, Mediterranean, Mexico, New Zealand and Australia. Description: At first glance the umbrella shell, could be mistaken for an egg mass. These are primitive pleurobranchs (side-gilled sea slugs) in which a large limpet-like external shell still remains as a protection for the gill plumes.Like other Opisthobranchs mollusc it has principally a soft body and no operculum.The animal can often be found attached to overgrown rock walls. It has a warty body and a small flat shell, which is too small for the animal to withdraw into. This mollusc has a light brown to bluish body and a single , plumed gill on the right side of the body. Opisthobranchs are characterized by two pairs of tentacles and a single gill behind and to the right of the heart (from which the group derives its name, Greek opisthen, behind + brankhia, gills). There is no marked distinction between head and mantle. The tentacles, situated close to the mouth, are used for orientation. Behind them you can find the rhinophores, olfactory organs often with complex formsThe rhinophores are rather large and are orange in colour. The middle part of the foot is the sole, used for locomotion. 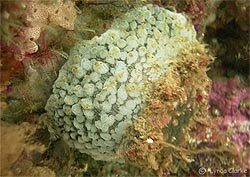 Ecology: This species is known to feed on sponges including large orange barrel sponges where it has been observed boring large holes.Maximum length is about 16cm. Status: Possibly the major threat to this and similar species would be habitat loss and declining water quality.